Back Door Donuts, iconic late-night spot in Oak Bluffs, is under new ownership. Three Boston businessmen are the new owners of Back Door Donuts and Martha’s Vineyard Gourmet Cafe and Bakery, the popular Oak Bluffs spot for everything from a late-night apple fritter to a wedding cake. Janice Casey, who has owned the business for 17 years with her partner, Rita Brown, confirmed the sale Wednesday morning. According to a press release, the new ownership group includes Richard Friedman, a longtime seasonal Edgartown resident, and Patrick Lyons and David Ginsberg, who both have homes in Chilmark. Mr. Friedman is a businessman and real estate developer who owns the Charles and Liberty Hotels in Boston. His home on Oyster Pond served as the summer White House when President Bill Clinton and his family came to the Island for summer vacations. Mr. Lyons is a well-known Boston businessman who owns several downtown restaurants and nightclubs. Mr. Ginsberg is the vice chairman of the Boston Red Sox and the Liverpool Football Club, according to the Red Sox website. Ms. Casey said the sale closed Tuesday. The purchase price has not been disclosed. Mr. Friedman could not immediately be reached for comment. Ms. Casey and Ms. Brown do not own the building, situated off Post Office Square in Oak Bluffs. The bakery opened in 2001 and is open seasonally from April through October. At night the back door opens to customers willing to wait in a long line for a hot doughnut, cinnamon roll, or large apple fritter, a cult favorite among the bakery’s fans. The late night doughnut tradition in Oak Bluffs goes back to when Peter White owned the Old Stone Bakery in that location, according to Gazette archives. While it isn’t clear when back door baked goods started, some say it began in the 1980s. The tradition continued after Ms. Brown and Ms. Casey bought the bakery in 2001 and survived a showdown with town officials. In June of 2004, Oak Bluffs selectmen ordered back door doughnuts closed, arguing that it was bad practice to sell food out of a back door and that the sales violated the town’s mandated restaurant closing time. Outraged fans responded with a petition of nearly 1,000 signatures, and in the end selectmen ordered that the bakery close when restaurants do, but allowed doughnut sales to go on. Over the years the Back Door tradition has only grown in popularity, with orderly lines of people lured in by the scent of hot doughnuts. Ms. Casey said the new ownership is committed to continuing the business as it is. She and Ms. Brown will stay on as consultants during the first year to assure a smooth transition. Raffi Jabri, the bakery’s longtime pastry chef, will stay on. “He’s really the man who runs the kitchen and runs Back Door Donuts, so it’s going to be the same food, the same apple fritters as always,” she said. Ms. Casey said the business had been up for sale informally. Ms. Casey said she and Ms. Brown were thankful to customers who had spread the word about Back Door Donuts. Saying goodbye to the business was bittersweet, she said. “It’s mixed. We’ve worked hard over the last 17 years,” she said. “We’ve spent a lot of time at the bakery and working on bakery things, so it’s sort of become our baby. So there’s some, not sadness, but some something that goes with selling it. I'm happy for Jan and Rita, as they can truly retire! However, it will be a sad change. I'm happy the new owner is committed to the traditions associated with Back Door Donuts and Martha's Vineyard Gourmet Cafe and Bakery! Will always remember them for our wedding cake! Ohhhhhhh! Thanks Rita & Janice;y'all did the Old Stone Bakery proud! Congrats to the new folks--Fritters at Fenway? We will miss Jan & Rita, always cheerful even during the craziest part of summer. Congratulations on a well earned retirement! Please make certain to pass on the cheese bread recipe. Toasted with salted butter, there is nothing like it anywhere on earth! I agree ~ cheddar Cheese Bread is a classic. Also lemon donuts. And maple iced with bacon. Well, everything, really. Happy retirement and welcome new owners. Don’t change anything except the crowding in the morning. So happy BDD is remaining open. I’d miss my late night run for those awesome doughnuts! CONGRATULATIONS,Jan, Rita, and Raffi!!! I am so very happy for you. Jan and Rita, thank you for being a great "last call" on many nights on the Vineyard. Enjoy your well deserved retirement. Richard, David and Patrick, you are now the stewards of an island institution. Please treat it like Fenway Park. Please elaborate on last sentence in reference to Fenway Park. That sort of scares me. Mr. Ginsberg is the vice chairman of the Boston Red Sox, maybe he will want to share some with the fans at Fenway. Enjoy retirement. You deserve it! Visiting from BERMUDA for the time to the Vineyard was summer 2017. I was told that my experience would not be complete if I hadn't had a Back Door Donut. So my friends took me & I treated everyone & received a souvenir bag. Had an awesome time. I'll be back. Sorry I never made it there. Enjoy retirement! My family and friends love BDD. The island wouldn't be the same without it (apple fritters included)! Our family has visited friends at Oak Bluffs for many summers. The highlight of trip is to enjoy the best apple fritters ever made! I have to have one every morning we are there. Good thing I don't live there all season, I'd sure add some lbs! Best wishes in retirement! Happy retirement to two wonderful generous people. Congrats Rita. Enjoy your first summer "off" in a long time. Well deserved!!!! Enjoy your retirement, Jan and Rita. You have many years of happiness ahead. Thank you for Back Door Donuts, one of our favorite summer joys. I hope the new owners don't change a thing. When my daughter and I were diagnosed with Celiac Disease two years ago, one of the things that made us most sad was that we would never get to eat Back Door Donuts again. Best wishes to you in your retirement! Thanks so much Jan & Rita for decades of this guilty pleasure. Back Door Donuts is a summer delight! Well, that's at least 15lbs less weight I won't have to lose. Enjoy your retirement! Wishing you the best in retirement. Nancy and I are looking forward to morning coffee and donuts, when we get back to the Vineyard in July. I've never been to Martha's Vineyard, or to Massachusetts for that matter. And I don't eat donuts because I have diabetes. 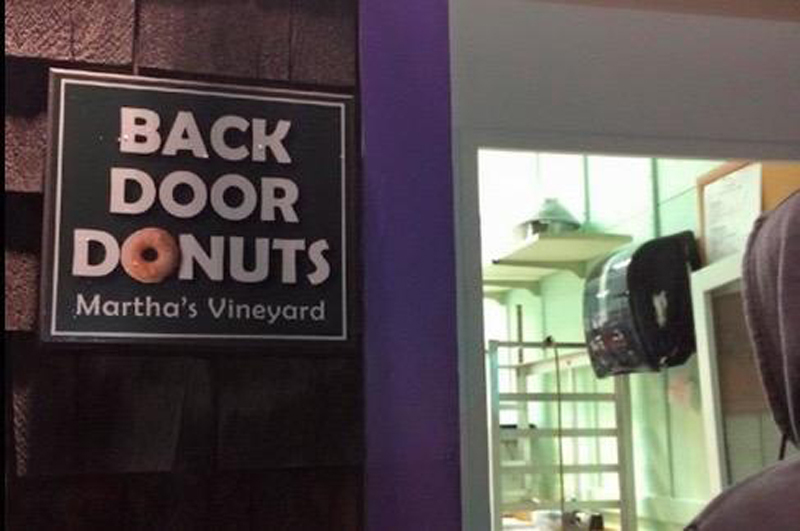 But if I ever went to Martha's Vineyard, I would have possibly tried a bit of a fritter at Back Door Donuts because you all make them sound so good. I believe I may have started the back door tradition in the 80s.... Cruising the island on motorcycles with a buddy, we were looking for a snack during the wee hours of the morning. With a light on we approached the back door, peeked inside and startled the baker. After explaining our hunger he was gracious enough to give us fresh donuts he was baking for the next morning. Pushing our luck, we made a repeat appearance at 2 AM the following morning. With a grunt and a smirk he offered us fresh donuts once again, but this time, for a fee. True story. 40 years later we still enjoy donuts from the back door with our kids. Please don't ever shut the back door. Congrats both to the retiring owners and the new management team! BDD is a cherished part of our annual Vineyard summer vacation. Please keep the staff intact and only upgrade the equipment. Some things don’t need improving. Bring all your happy memories with you, enjoy retirement, you worked hard for it and deserve each and every day.............! How wonderful that Head Pastry Chef, Raffi and Assistant Pastry Chef, Shirley will continue to carry on with what makes the Martha's Vineyard Gourmet Cafe and Bakery and Back Door Donuts the notable and special place that it is. It just won't be the same without the warmth of spirit of Rita and Jan (the binding ingredient that makes the Bakery and Back Door Donuts the appealing destination it is). So glad that I will at least get to see Rita there during the transition. Don't forget to mentioned the time during the early 70's when the famous cinnamon buns were "Secretly" sold out of the back door late at night while the town bars were closing. That started the whole back door thing. The owner at that time was a very nice baker, I believe, named Peter, who conducted a noble, community service by supplying freshly made, unbelievably delicious, cinnamon buns that soaked up the liquor in the stomachs of many a bar reveler before their drive home. Even though the late-night service was technically not quite legit at the time, its honorable intentions eventually named the bakery and ushered it into the fine establishment that it is today. Thank you, old owners and good luck, new owners!